A 67-year-old man with a history of hypertension, peripheral vascular disease, status post femoral artery bypass procedure, tobacco use, and moderately disabling rheumatoid arthritis presents for evaluation of a left foot ulcer. He has had intermittent light-headedness. The following electrocardiogram (ECG) is obtained (Figure 1). 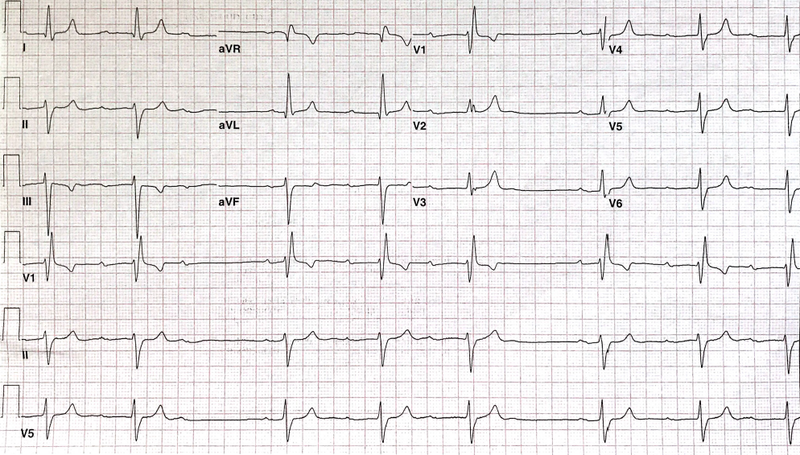 The ECG shows which of the following? A. Mobitz I AV block. B. Blocked atrial premature beats (APBs). C. Prior inferior myocardial infarction. The correct answer is: A. Mobitz I AV block. The ECG demonstrates sinus bradycardia with first degree AV block with progressive PR prolongation. The first pause is likely due to Mobitz I AV block (AV Wenckebach phenomena). The second pause is most likely secondary to sinoatrial exit block (there is no P wave seen before the Mobitz I AV block cycle resets); see Figure 2. Longer rhythm strip is needed to confirm repeated sinoatrial exit block. Blocked APBs can lead to the group beating pattern seen here; however, the pause is not the result of a blocked premature atrial beats, but rather the result of a "dropped" QRS. The axis in the frontal plane is approximately -60 degree indicative of left anterior fascicular block (LAFB), and there is not clear criteria for prior inferior MI. The QRS duration is 148 milliseconds with right bundle branch block pattern. Complete heart block is not presentthere is no AV dissociation, and the ventricular rate is irregulargroup beating consistent with Mobitz I, possible sinoatrial exit block, and other processes such as concealed His extrasystoles. The presence of bifascicular block (RBBB + LAFB) in the context of a wide QRS and AV Wenckebach suggests that the level of block is possibly infranodal. A permanent pacemaker is indicated given symptomatic bradycardia, especially in the context of infranodal location. Mond HG and Vohra J. The Electrocardiographic Footprints of Wenckebach Block. Heart Lung Circ 2017;26:1252-66. Valentinuzzi ME. Sinoatrial and Atrioventricular Blocks: Who First Described Them and How? [Retrospectroscope]. IEEE Pulse 2017;8:62-6.